For Lincolnshire-born Tim and his Stratford upon Avon-born wife Vaughan, Seven Springs is the culmination of an ambition they had cherished since living in South Africa for a short period in the 1990s. 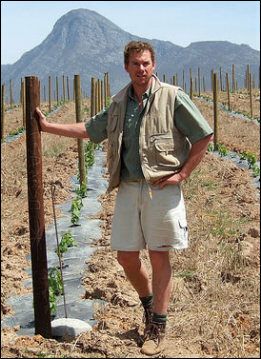 The idea of owning and operating a vineyard in the Cape took hold, and the search was on to find a suitable plot of land. In fact the 13-hectare site they found in 2006 was within the prestigious Hemel en Aarde Valley south east of Cape Town, but it was a virgin site of bare earth, which meant they had to create the whole vineyard infrastructure from scratch. Vineyard manager Peter Davison has been on board since the planning stages of the project. He has managed the preparation and planting of the vineyard. Sauvignon Blanc and Chardonnay were the first plantings in this cool area that suits aromatic varieties best, with Syrah and Pinot Noir having now also come on stream. Shown left, Peter in his newly planted Syrah vineyard with Babylon’s Tower mountain in the background. Tim and Vaughan’s winemaker is 26-year-old Riana van der Merwe, a local girl who trained in Stellenbosch and who has worked in various Cape estates including L’Ormarins and Backsberg. She has also made wine for Stonestreet Winery in California and at Domaine François Villard in the northern Rhône Valley. Perhaps it’s the wide-ranging experience she has packed into her short career so far, but one thing is for sure: Riana has a wise head on her young shoulders. All of her Seven Springs wines show an innate restraint and classicism. She is a winemaker with a real understanding of how the cooler conditions of this region and the shale soils of the vineyard can be allowed to very naturally shape the style of the wines she is making. Tim Pearson recently sent me a selection of their current releases so that I could judge how this promising young Cape estate is progressing. 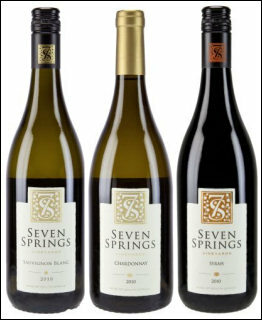 Seven Springs is imported into the UK by Belle Epoque Wines of Norfolk, who retail online as bijoubottles.co.uk. The wines are widely available through independent merchants too. For now, the vines are maturing, the team is learning about their soils and climate and the project progresses with ambitious plans for a winery and tasting room. This is one new South African name to watch. A nice time to revisit the first ever release from Seven Springs, which was good enough to be my Wine of the Week back in February 2011. It’s a Sauvignon in a very dry, pure and elegant style, and that character is still abundantly clear two years on. Apples and creamy citrus are more dominant than any grassy aromas, with the palate still vibrant and punchy, a squirt of lemon juice cleaving through a quince-like ripeness and some salty mineral tones in the finish. 90/100. £11.95, bijoubottles.co.uk. See all stockists on wine-searcher.com. As it says on the label, a Chardonnay fermented in steel tanks with no exposure to oak, and a new product in Seven Springs’ range, showing a restless need to explore the potential of their young vines and this terroir. There’s an elegant perfume to this wine, with a little blossom or peach-skin fragrance, some dry apple fruit notes and a hint of something stony and mineral. On the palate it is juicy and led by citrus and underripe apple – a quite steely, in some ways quite austere, but there is a burgeoning sense of creaminess and those peachy tones beneath the citrus tang. A nice wine that would be joyous with some pan-fried mullet or seabass. 88/100. £11.95, bijoubottles.co.uk. See all stockists on wine-searcher.com. Fermented only in older oak barrels, there is barely any oak influence discernible on the nose of this very natural wine with its gently earthy and oatmeally edges to citrus and crisp, fresh, apple-skin fruit. On the palate it is a wine with a fine texture and its moderate 13.5% alcohol adding no real weight, so that crisp, racy and fresh fruit drives the wine, with a little nutty and honeyed character that is quite Burgundian, and plenty of clean, fresh, nicely long and precise acidity into the finish. Subtle and absolutely lovely. 90/100. £13.95, bijoubottles.co.uk. See all stockists on wine-searcher.com. A second tasting based on a fairly brief encounter where this wine was shown at The Wine Gang Fair in London earlier this month again struck me as a nicely fragrant, pepper and sleek black-fruited wine. This is my full note from a proper assessment of it in July 2012. This Syrah from young vines is a new release. The nose is opulently rich and crammed with plum and red berry fruit. Ageing in older French barrels adding some spice and delicate smokiness, with a hint of crisply-grilled bacon fat. On the palate it is fresh and vibrant, with real depth but bounding youthfullness and ocean-influenced clarity. 90/100. £13.95, bijoubottles.co.uk. See all stockists on wine-searcher.com. I can’t think of many wine producers who would boast – or is that admit – to ‘Young Vines’ right on the front label of their Pinot; there’s a common belief amongst many wine lovers that only old vines make great wine. In fact this is an over simplification. Various viticultural practices can instil quality even in young vines, most importantly making sure the yield of these vigorous youngsters is controlled. What young vines can – and in this case do – bring to the party is a joyous, upfront fruitiness. The colour is a lovely pale garnet and the nose offers authentic, lightly smoky and truffly aromas of woodland and berries. On the palate this is finely-wrought and beautifully fruity, with cherry and summer pudding berries against a background of tobacco and briar, into a fresh, juicy, positively crisp finish. Just lovely. 90/100. £13.95, bijoubottles.co.uk. See all stockists on wine-searcher.com.